In a bilateral meeting, His Holiness, Pope Francis thanked Prime Minister Barzani for his visit. He expressed his gratitude to the Kurdistan Regional Government (KRG) and the people of the Kurdistan Region for hosting people were displaced as a result of the fight against ISIS terrorists, highlighting the plight of Christians in particular. Pope Francis called for the coexistence, peace and stability that exist in the Kurdistan Region to prevail and hoped that all problems would be solved through peaceful dialogue and mutual understanding. His Holiness told Prime Minister Barzani that he will pray for continued success, harmony, and coexistence. 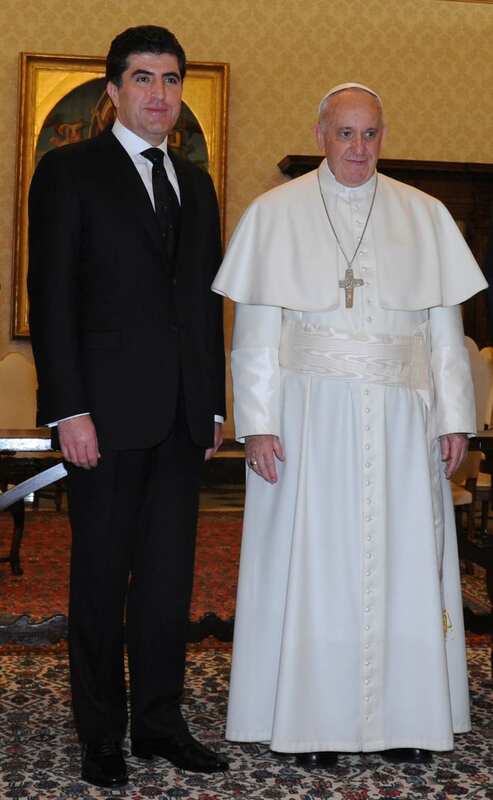 Prime Minister Barzani said he was pleased to meet His Holiness Pope Francis for the second time. The Prime Minister briefed His Holiness on the situation in the region, the economy and the political challenges that Kurdistan Region has been experiencing, including the war with ISIS, issues with Baghdad, and recent developments in the disputed territories that caused the displacement of large numbers of people to Kurdistan again. The Prime Minister asked the Pontiff to play a role in resolving outstanding issues between Erbil and Baghdad. Prime Minister Barzani stressed that the KRG will continue protecting the coexistence of its Christian component, as it constitutes an important part of the Kurdistan Region's culture heritage and social fabric. Nearly all Chaldean, Syriac, and Assyrian Christians in Iraq reside in the Kurdistan Region. In a meeting with Pietro Parolin, Secretary of State, Prime Minister Barzani shed light on the political and economic situation in the Kurdistan Region, recent developments regarding Erbil-Baghdad relations, as well as the efforts to start dialogue between the KRG and the federal Iraqi government. Cardinal Parolin thanked Kurdistan's people and government for helping and supporting displaced people as a whole and Christians in particular. He wished that all outstanding issues between Erbil and Baghdad to be solved through dialogue and understanding.